Besides all the humor from start to finish, Mullen also shared his heartbreak over the loss of Wally, his beloved Maltese, who suffered a heart attack in Mullen’s mother’s arms when he was at work. Anyone who has loved a dog as much as he has will certainly feel tears coming to their eyes when photos are shared of their happy times together as the story is being told. But thanks to his new companion, Choo Choo, an energetic Chihuahua -Yorkie mix who is cute as a button, I know more happy times are ahead for this artistic and totally out and proud artistic fast food lover. But how can he eat like that and not weigh 300 pounds? We are all way too envious of that fact. Loved all the local characters Mullen portrays as he shares stories about them, including a homeless man who gets fed by all the locals and others who approach him for money or cigarettes as he enters the market. Would be great to see photos of those characters – or Mullen in costume of those characters, on the screen as he shares tales of the two most important things in the world: love and carbs. I am right there with him! Costumer extraordinaire Michael Mullen challenged himself, after much pushing from many of his Facebook friends, to create a solo show about his life for this year’s Fringe. And thankfully, he agreed. But it’s not so much about costumes as it is about his life, living in Hollywood and dealing with his many food cravings while walking the local streets or shopping at the Rock and Roll Ralphs on Sunset Blvd. 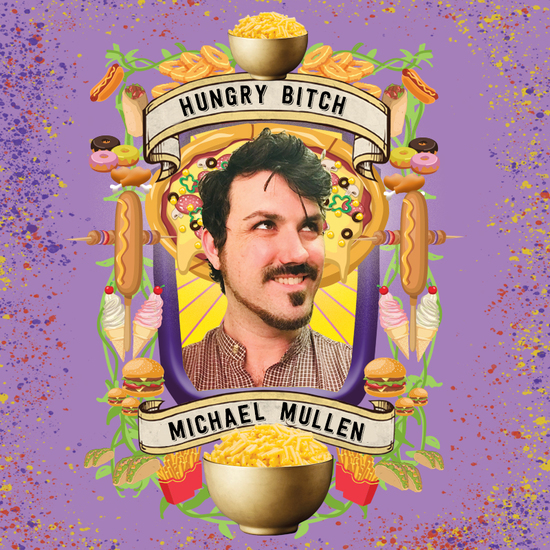 Ever on his mind is his favorite food craving of all, mac and cheese, so much so that whenever that tasty item is mentioned, Mullen takes a game show model’s pose to highlight a yummy photo of the creamy comfort food which is displayed on a screen above the stage. And all throughout, we hear about his man crush on his hunky, down-the-hall neighbor Robert, who he thinks is straight and living with a cute girlfriend. Think again Michael – after a chance meeting in the apartment’s elevator and hot tub!